‘I work in metaphors’, says Philip Sutton surrounded by his colourful, vibrant work in his West Bay home. He is eager to tell the story. ‘I saw something the other day, which I thought was a perfect metaphor for creativity’, he continues, ‘I often go for a walk around the harbour and on a busy, sunny Saturday a few weeks ago the whole place was filled with families, flags, sunshine, ice cream and chips, but amongst the chaos a small girl of about two years old was riding a bike with no pedals. She was flying, weaving between adult giants and completely lost in the activity, mastering the skill. No one noticed her, but I noticed her. Her bike wasn’t real, it was a toy, but she rode it as if it was real. She was totally absorbed in her task and her belief in what she was doing. For her, it was completely credible and engrossing and this, for me, is similar to the creative process. We are children of what we do’. Philip Sutton is about to celebrate his 90th birthday and is as energetic and engaged in his work as a man half his age. 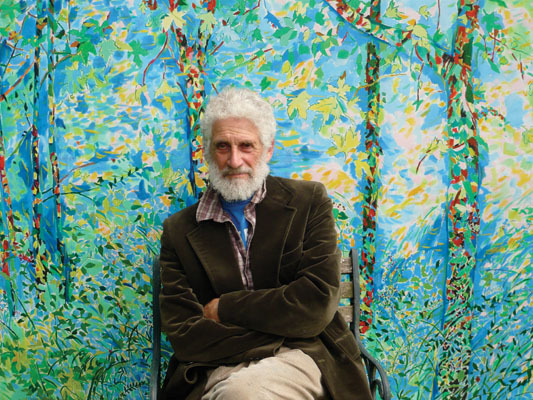 His long career, spanning nearly seven decades, has seen many changes in the art world. He started working in the 1950s and paints large, lively, joyful works based on nature and portraiture. ‘My work hasn’t always been fashionable’, he concedes. As Abstract, Pop Art and installation grew in popularity, Philip continued to work from observation. The sense of being an outsider has informed his working practice from very early on ‘I was a London child, so spent a large part of the war as an evacuee’, he says. Although he remembers only kindness from the people he stayed with, he was moved on frequently and developed an acute sense of loneliness. He has carried this feeling with him throughout his life and it is part of the reason he continues to paint. ‘Making work has always been about compensating for that sense of loneliness’ he says, ‘being completely captivated by the task in hand’. Despite being married for sixty-four years (his wife Heather died in 2017) with four children and an assortment of grandchildren, the sense of being an outsider is apparent. He found recognition very early on in his career, being accepted into the London Group in 1956 and elected as an Associate Royal Academician in 1977, he felt out of step with the art world. So much so, that in 1963 he decamped the whole family and went to live and work in Fiji for three years. ‘It was a particularly happy time for our family’, he recalls. It took six weeks by boat to reach Fiji in those days and cost £4000—a huge sum of money (a quick Google revealed it to have the spending power equivalent £79,000 today!). ‘I had a successful exhibition the year before’, he recalls, ‘many people advised me to pay off the mortgage, but we went on an adventure instead. It was money well spent’. Time to paint in the way he wanted, free from the vagaries of the fashionable London art scene, was time to immerse himself in the business of painting, of training his eye. ‘Ultimately, it all comes down to trusting the eye’, he says. ‘It is about taking the brain out of the equation and letting the eye do its job’. He describes trusting the eye as being like a child holding its mother’s hand—complete in the knowledge of being cared for—or treating the eye as like a camera with no one behind it. ‘I never know what is going to take my eye’, he says. ‘If I go for a walk around the harbour, I don’t go searching for an interesting piece of rope; however that is exactly what catches my eye that day, and I just need to be open to it’. His lifelong journey has been about learning to trust the eye and the hand. The book Zen and the Art of Archery by the German philosopher Eugan Herrigel, has been a significant influence on him. The book, published in 1948, explores the concept of cultivating effortless physical skill through years of practice and letting go of conscious control of the mind. It is something to do with getting out of the way of the self (ego) and allowing the body to become at one with achieving a physical prowess. Philip concedes that, even at ninety, he is still in training. ‘There is no destination’, he says, ‘It is all about the journey’. He believes it is a fatal mistake for an artist to succumb to the idea of talent. ‘Painting is all about listening to the heart’, he says. ‘Talent is something unquantifiable, like the taste of an apple. We all know what an apple tastes like, but it is impossible to describe’. Subscribing to the idea of being a talented artist takes away from the goal of allowing the hand and the eye to do their work. The concept of talent is all about ego and can only obstruct the artistic process in his view. Philip studied at the Slade and went on to teach there for almost a decade. He describes the experience as overly academic. ‘I couldn’t relate to the Great Masters’, he says. Art school, in his opinion, can derail young artists. ‘It is human nature to want to belong to a group’, he thinks, ‘and that can disrupt the creative process. Wanting to be part of something that everyone else thinks is a good idea is only natural, but the eye doesn’t understand what contemporary means’. If he were to offer any advice to a young artist, he says this—‘Find your language—a language you are comfortable with and practise it. All art forms have a language’, he says, ‘try and invent your own’.